Deputies Arrest Man in Indian Springs Shooting, INDIAN SPRINGS, November 8, 2013 - Deputies with the Polk County Sheriff's Office arrested and charged 20 year old Richard Alan Gagnon, of Indian Springs with murder. Gagnon allegedly shot and killed 43 year old Brent Ryter, 43, also of Indian Springs on November 6th. Deputies responded to the residence on November 6th and arrived to find Gagnon at the residence and Ryter inside the residence deceased. On November 6th 2013 the Polk County Sheriff's Office Criminal Investigation Division responded to a shooting incident in the subdivision of Indian Springs. 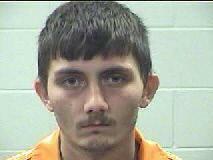 Upon arrival detectives were able to identify the suspect as Richard Gagnon Jr., 20, of Livingston Texas and detained him. Detectives made entry into the residence and found the victim Brent Ryter, 43, also of Livingston, deceased with an apparent gun shot wound. The circumstances and actions which lead to the shooting of the victim are still under investigation by Sheriff's Office. Editor's Note: The press release did not state what charges have been brought against the suspect. This is however not unusual since the incident remains under investigation. If and when we get anymore information on this incident, we'll post it on this website.